Objectives: In dogs with deep analgesia caused by acute spinal cord injury from thoracolumbar disk herniation, autologous bone marrow mononuclear cell transplant may improve recovery. The purpose of the present study was to evaluate autologous bone marrow mononuclear cell transplant in a dog that had paraplegia and deep analgesia caused by chronic spinal cord injury. Materials and Methods: Autologous bone marrow mononuclear cell transplant was performed in a dog having paraplegia and analgesia for 3 years that was caused by a chronic spinal cord injury secondary to Hansen type I thoracolumbar disk herniation. Functional recovery was evaluated with electrophysiologic studies and the Texas Spinal Cord Injury Scale. Results: Somatosensory evoked potentials were absent before transplant but were detected after transplant. Functional improvement was noted (Texas Spinal Cord Injury Scale: before transplant, 0; after transplant, 6). No adverse events were observed. Conclusions: Autologous bone marrow mono-nuclear cell transplant into the subarachnoid space may be a safe and beneficial treatment for chronic spinal cord injury in dogs. Bone marrow mononuclear cells may have a protective effect on the spinal cord, and an autologous bone marrow mononuclear cell transplant may promote spinal cord regeneration and functional recovery in rats that have spinal cord injury.3 In dogs with deep analgesia caused by an acute spinal cord injury from thoracolumbar disk herniation, an autologous bone marrow mononuclear cell transplant may improve the frequency of recovery compared with surgical intervention without a transplant.2 However, a literature review did not show any previous cases of bone marrow mononuclear cell transplant in dogs with chronic spinal cord injury and long-term analgesia. In the present study, we performed surgical decompression and autologous bone marrow mononuclear cell transplant in a dog with paraplegia and deep analgesia for 3 years running that was caused by a chronic spinal cord injury secondary to Hansen type I disk herniation. Follow-up evaluation showed improved motor function. A male miniature dachshund (age, 7 y; body weight, 2.9 kg) was diagnosed 3 years ago at another clinic as having paraplegia and analgesia caused by Hansen type I disk herniation. The owner declined surgical treatment because the physician’s opinion that that ambulatory recovery was unlikely. Symptoms did not improve despite nonoperative treatment including acupuncture and rehabilitation. Evaluation at our clinic, 3 years after the onset of symptoms, showed that the dog appeared healthy, had an appetite, and was in good general condition. Blood test results were normal. The present study was performed in accordance with the Japanese Regulations for Animal Welfare issued by The Ministry of Education, Culture, Sports, Sciences, and Technology of Japan. Improvement of function was evaluated with the Texas Spinal Cord Injury Scale.5 This scale evaluated each pelvic limb separately and had 3 components (gait [range per limb, 0 to 6]; proprioceptive positioning [range per limb, 0 to 2]; and nociceptive response [range per limb, 0 to 2]) that were based on typical clinical neurologic examination techniques for dogs (Table 1). Gait scores for pelvic limbs were based on clinically relevant movement of the limbs. Proprioceptive positioning (also termed “knuckling”) was a postural reaction test. Nociceptive response was assessed by applying a painful stimulus (clamping a hemostat on the distal aspect of the limb or on a nail bed of a digit) and observing the dog for physiologic (tachycardia, tachypnea, and mydriasis) or behavioral responses (orientation toward the stimulus, vocalization, and licking). 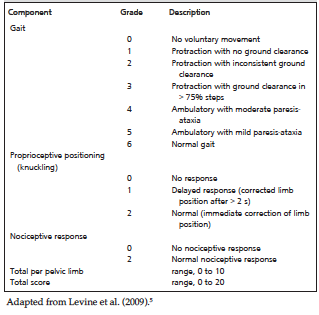 The total score for each pelvic limb was the sum of the scores for gait, proprioceptive positioning, and nociceptive response (total per limb: range, 0 to 10), and the total score for the dog was the sum of the scores for the 2 pelvic limbs (total: range, 0 to 20) (Table 1). Somatosensory evoked potentials were measured with the dog under general anesthesia with isoflurane (Neuropack MEB-9102, Nihon Kohden, Tokyo, Japan). Surface disk electrodes were used as the recording and reference electrodes. The recording electrode was placed at the junction of the coronal and sagittal sutures, and the reference electrode was placed on the spinous process of the second cervical vertebra as previously described.6 Electrical stimulation was applied (frequency, 3 Hz; duration, 0.2 ms).6 The average of 500 responses was determined in each session. Computed tomography (slice thickness, 1 mm) (Asteion, Toshiba Medical Systems, Tokyo, Japan; Virtual Place Advance Lexus workstation, AZE, Tokyo, Japan) and magnetic resonance imaging scans of spinal cord injury (T1- and T2-weighted images) (0.2-T Vet-MR, ESAOTE S.p.A, Genova, Italy) were performed with the dog under general anesthesia. Bone marrow mononuclear cells were isolated from a bone marrow aspirate that was collected from the proximal humerus using a bone marrow aspiration needle (16-gauge; 6.83 cm) (Angiotech Pharma-ceuticals, Vancouver, BC, Canada) as previously described.2 Collected bone marrow (5 mL) was mixed with heparinized saline (5 mL; physiologic saline [4 mL] and sodium heparin solution [1 mL]) (Shimizu Pharmaceutical, Shizuoka, Japan). The mixture was subjected to density gradient centrifugation on density gradient medium (density, 1.077 g/mL; volume, 4 mL) (Lymphoprep, Nycomed Pharma, Oslo, Norway) to isolate bone marrow mononuclear cells. Anesthesia was induced with intravenous propofol (7 mg/kg) (Intervet, Ibaraki, Japan) and maintained with isoflurane (1.5% to 2.0%) (Abbott Laboratories, Abbott Park, IL, USA). Hemilaminectomy was performed to extract protruded disk tissue from the vertebral canal. The extracted disk tissue was evaluated with histology. The bone marrow mononuclear cell suspension (0.2 mL) was injected slowly (duration of injection, 1 min) with an insulin pump (29-gauge) (BD Ultra-Fine, Becton-Dickinson, Fukushima, Japan) into the subarachnoid space at the level of the disk herniation. Preoperative and postoperative pain was treated with once buprenorphine (20 μg/kg) (Otsuka Pharmaceutical, Tokyo, Japan). Cefazolin sodium (25 mg/kg, twice daily for 1 week) (Nichi-Iko Pharmaceutical, Toyama, Japan) was given after surgery. Cytologic examination of bone marrow mononuclear cells was performed with smear slides of bone marrow mononuclear cell suspension that were prepared before transplant. The smear slides were fixed with methanol and stained with Wright-Giemsa stain (Muto Pure Chemicals, Tokyo, Japan). Cells (1000 cells per slide) were examined and classified according to morphologic characteristics. Quantitative real-time polymerase chain reaction was performed to analyze cytokines in canine bone marrow mononuclear cells. Reverse transcription of the total RNA (1 μg) was performed (38ºC; 15 min) in reverse transcription reagent (20 μL) (Prime Script RT reagent, Takara, Shiga, Japan). After inactivating the reverse transcription reaction by heating (85ºC; 5 s), the cDNA product was subjected to quantitative real-time polymerase chain reaction (TaqMan Universal Master Mix II and ABI 7500 Real Time PCR system Sequence Detection System, Applied Biosystems, Foster City, CA, USA). A shuttle polymerase chain reaction protocol was used (50ºC for 10 min, then 40 cycles at 95ºC for 15 s, then at 60ºC for 1 min) (reaction volume, 20 μL). The reaction mixture included template cDNA (2 μL), Probs (TaqMan Gene Expression Assays, Applied Biosystems) (interleukin 4 [IL-4], interleukin 10 [IL-10], hepatocyte growth factor, interleukin 6 [IL-6]; 1 μL each) (Applied Biosystems), buffer (Master Mix II, Applied Biosystems) (10 μL), and distilled water (7 μL). Relative gene expression values were calculated with the comparative threshold cycle (ΔΔCt) method using software (Sequence Detection System 1.2 software, Applied Biosystems). This method gave the amount of target gene normalized to an 18S ribosomal RNA and was used to determine the mRNA levels of IL-6. The relative expression levels were calculated using the formula ΔΔ threshold cycle (Ct) = ΔCt target mRNA level - ΔCt IL-6, and the value of relative targeting mRNA expression was determined using the expression 2-ΔΔCt. A sample from the bone marrow mononuclear cell suspension was cultured on tryptone soya agar (30ºC; 7 d) (Nissui Pharmaceutical, Tokyo, Japan). Performance status and blood testing results (white blood cell count, C-reactive protein) were checked for the presence of adverse events 180, 365, 545, 730, and 1245 days after transplant. 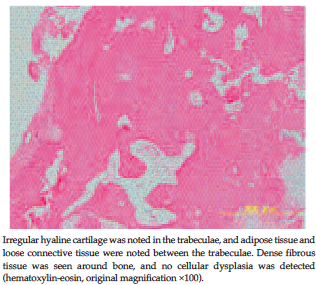 Histologic examination of the excised disk tissue showed irregular hyaline cartilage in the trabeculae and adipose tissue and loose connective tissue between the trabeculae. Dense fibrous tissue was seen around bone, and no cellular dysplasia was detected (Figure 1). The culture showed no bacterial growth. Cytologic examination of bone marrow mononuclear cells showed a predominance of neutrophils (band and segmented), polychromatic erythroblasts, myelocytes, and metamyelocytes (Table 2). 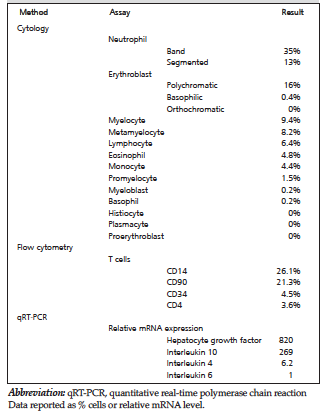 Flow cytometry showed that T cells predominantly were CD14 and CD90 cells (Table 2). Quantitative real-time polymerase chain reaction showed a predominance of mRNA of hepatocyte growth factor and IL-10 (Table 2). Neurologic testing before transplant showed no hind leg posture responses for proprioception, placing reaction, or hopping reaction; the panniculus reflex was absent at and caudal to the T13-L1 intervertebral space; and pain sensation was absent in both hind legs. At 11 days after transplant, proprioception and placing reaction were improved, but pain sensation was absent in both hind legs at 1245 days after transplant (Table 3). After transplant, the total Texas Spinal Cord Injury Scale score was improved (before transplant, 0; day 11 after transplant, 4; day 37 and day 1245 after transplant, 6) (Table 3). However, at day 1245, the dog was unable to walk independently. Somatosensory evoked potentials were not detected before transplant but waveforms were detected with small amplitude and delayed latency at day 11 after transplant. 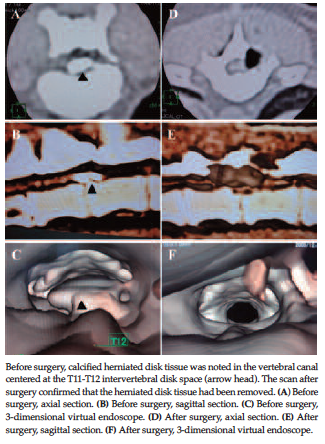 A computed tomography scan before surgery showed calcified herniated disk tissue in the vertebral canal centered at the T11-T12 intervertebral space; postoperative computed tomography scan confirmed that the herniated disk tissue had been removed (Figure 2). 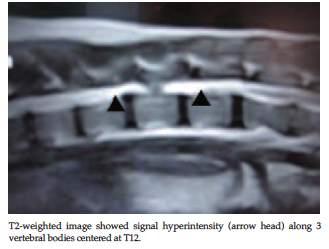 The T2-weighted magnetic resonance imaging scan after surgery showed signal hyperintensity along 3 vertebral bodies centered at T12 (Figure 3). No adverse events were observed in follow-up examinations at 180, 365, 545, 730, and 1245 days after transplant. The dog in this report had been diagnosed with paraplegia and analgesia caused by Hansen type I disk herniation at T11-T12. Analgesia is an important prognostic factor in canine disk herniation, and spinal cord function typically does not recover when pain sensation is absent for > 2 weeks.8 No effective curative therapy is available for chronic spinal cord injury. Therefore, neurologic improvement was very unlikely in this dog. The presence of calcification in the herniated disk tissue was evidence that this tissue had been herniated for 3 years (Figure 2). Cell transplant had been performed previously by injection into the injured spinal cord, intravenous injection, and intrathecal implant.16-18 Comparison of intravenous, lumbar puncture, and intracerebro-ventricular routes showed that intravenous transplant was the least efficient method.19 Direct transplant into the injured spinal cord may be significantly more effective in improving neurologic symptoms than intravenous transplant.20 In the present case, we injected the cells into the subarachnoid space near the injured spinal cord, and there were no serious adverse events or abnormal findings evident on magnetic resonance imaging or electrophysiologic examination for 1245 days after transplant. In conclusion, heterogeneous bone marrow mononuclear cell transplant may have neuropro-tective and neurotrophic effects on the chronically injured spinal cord and may promote recovery of motor function despite prolonged paraplegia and analgesia. In the present case, no adverse events were observed at 1245 days after bone marrow mononuclear cell transplant. Further study may be directed to optimize the procedure by adjusting the frequency of transplant and the number of cells for transplant. Autologous bone marrow mononuclear cell transplant into the subarachnoid space may be useful in treating chronic spinal cord injury in dogs. Itoh H, Hara Y, Yoshimi N, et al. A retrospective study of intervertebral disc herniation in dogs in Japan: 297 cases. J Vet Med Sci. 2008;70(7):701-706. Tamura K, Harada Y, Nagashima N, et al. Autotransplanting of bone marrow-derived mononuclear cells for complete cases of canine paraplegia and loss of pain perception, secondary to intervertebral disc herniation. Exp Clin Transplant. 2012;10(3):263-272. Yoshihara T, Ohta M, Itokazu Y, et al. Neuroprotective effect of bone marrow-derived mononuclear cells promoting functional recovery from spinal cord injury. J Neurotrauma. 2007;24:1026-1036.
de Lahunta A. General somatic afferent system - GSA. In: de Lahunta A, ed. Veterinary Neuroanatomy and Clinical Neurology. 2nd ed. Philadelphia: WB Saunders Company; 1983:166-169. Levine GJ, Levine JM, Budke CM, et al. Description and repeatability of a newly developed spinal cord injury scale for dogs. Prev Vet Med. 2009;89(1-2):121-127. Uzuka Y, Saitoh M, Hiramatsu I, Nagata T. Studies on the factors affecting the recording of somatosensory evoked potentials induced by tibial nerve stimulation in dogs. J Vet Med Sci. 1995;57(5):871-876. Pelosi L, Lamb J, Grevitt M, Mehdian SM, Webb JK, Blumhardt LD. Combined monitoring of motor and somatosensory evoked potentials in orthopaedic spinal surgery. Clin Neurophysiol. 2002;113(7):1082-1091. Laitinen OM, Puerto DA. Surgical decompression in dogs with thoracolumbar intervertebral disc disease and loss of deep pain perception: a retrospective study of 46 cases. Acta Vet Scand. 2005;46(1-2):79-85. Okuno S, Nakamura A, Kobayashi T, Orito K. Effectiveness of intraoperative somatosensory evoked potential monitoring during cervical spinal operations on animals with spinal cord dysfunction. J Vet Med Sci. 2005;67(7):719-722. Zentner J, May J. Intraoperative monitoring with somatosensory evoked potentials in neurosurgical operations on the spinal cord. Cent Nerv Syst Trauma. 1987;4(3):197-207. Date I, Takagi N, Takagi K, et al. Hepatocyte growth factor attenuates cerebral ischemia-induced learning dysfunction. Biochem Biophys Res Commun. 2004;319(4):1152-1158. Shi E, Jiang X, Wang L, Akuzawa S, Nakajima Y, Kazui T. Intrathecal injection of hepatocyte growth factor gene-modified marrow stromal cells attenuates neurologic injury induced by transient spinal cord ischemia in rabbits. Anesthesiology. 2010;113(5):1109-1117. Widenfalk J, Lipson A, Jubran M, et al. Vascular endothelial growth factor improves functional outcome and decreases secondary degeneration in experimental spinal cord contusion injury. Neuroscience. 2003;120(4):951-960. Rehman J, Li J, Orschell CM, March KL. Peripheral blood "endothelial progenitor cells" are derived from monocyte/macrophages and secrete angiogenic growth factors. Circulation. 2003;107(8):1164-1169. Kumar AA, Kumar SR, Narayanan R, Arul K, Baskaran M. Autologous bone marrow derived mononuclear cell therapy for spinal cord injury: a phase I/II clinical safety and primary efficacy data. Exp Clin Transplant. 2009;7(4):241-248. Yano S, Kuroda S, Shichinohe H, et al. Bone marrow stromal cell transplantation preserves gammaaminobutyric acid receptor function in the injured spinal cord. J Neurotrauma. 2006;23(11):1682-1692. Syková E, Jendelová P, Urdzíková L, Lesný P, Hejcl A. Bone marrow stem cells and polymer hydrogels - two strategies for spinal cord injury repair. Cell Mol Neurobiol. 2006;26(7-8):1113-1129. Bakshi A, Barshinger AL, Swanger SA, et al. Lumbar puncture delivery of bone marrow stromal cells in spinal cord contusion: a novel method for minimally invasive cell transplantation. J Neurotrauma. 2006;23(1):55-65. Bakshi A, Hunter C, Swanger S, Lepore A, Fischer I. Minimally invasive delivery of stem cells for spinal cord injury: advantages of the lumbar puncture technique. J Neurosurg Spine. 2004;1(3):330-337. Vaquero J, Zurita M, Oya S, Santos M. Cell therapy using bone marrow stromal cells in chronic paraplegic rats: systemic or local administration? Neurosci Lett. 2006;398(1-2):129-134. Acknowledgements: We greatly appreciate the staff of Aikou Ishida Animal Hospital who performed the sample collection. Public funds were not used in this work; it was supported through private funds of the Aikou Ishida Animal Hospital. The authors have no conflicts of interest to declare.